Cleo Mae “Billie” (Amick) Von Riesen, 100 was born on March 18, 1916 to Ebeline (Wright) and John Amick in Fort Morgan, Colorado. She grew up in Fort Morgan and graduated from Fort Morgan High School in 1934. Her love was music and she played and taught the violin in the community. She attended Tarkio College in Tarkio, Missouri for 2 years. Billie married Gerhard Von Riesen on April 5, 1940 at Ensign United Presbyterian Church. A reception was held at her parent’s home, 422 Maple Street. They had two children, a daughter, Kathleen and a son, John. In 1957, the family moved to Brush, Colorado to open V&H Furniture. Billie continued to be active with raising her children, bridge groups, church activities and a string quartet. After Gerhard passed away in 1980, she moved into a condo in Brush and began to travel. Some of the places she visited were Hawaii, Egypt, The Galapagos Islands and South America, England, Ireland, Russia, Mongolia, India, Canada and Israel. Helping others, she drove many cancer patients to Denver for treatments. 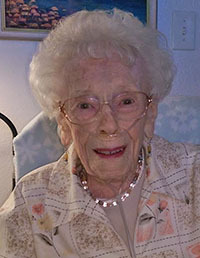 Billie lived at Appleleaf Assisted Living in Berthoud until her passing, enjoying visits from her family and friends. Her family include her daughter, Kathleen Gigliotti and husband, Vincent of Castle Rock, Colorado; son, John Von Riesen and wife, Cathy of Windsor, Colorado; granddaughter, Christy Gigliotti and husband Jonas Feinstein of Fort Collins, Colorado; granddaughter, Alissa Gigliotti and husband, Boyd Wright of Fort Collins, Colorado; grandson, Alex Von Riesen of Windsor, Colorado; great-grandsons, Cedar and Roan Feinstein and Byron Wright of Fort Collins, Colorado. Billie celebrated her 100th birthday at Appleleaf and at a reception in Windsor with her family and friends. A Memorial Service is scheduled for 2:00 PM, Saturday, August 13th at Rankin Presbyterian Chruch, 420 Clayton Street, Brush, Colorado. Interment will be at the United Presbyterian Church, 1300 E. Riverview Avenue, Fort Morgan, Colorado in the Columbarium. Memorials may be made in Cleo Mae Von Riesen’s name to the Rankin Presbyterian Church, 420 Clayton Street, Brush, Colorado 80723. Please visit www.goesfuneralcare.com to leave condolences and share memories. Site contents copyright © 2019 Recorder Online	except as noted. All rights reserved. | 88 queries in 2.254 seconds.